My huskies are eager to whisk you and your children through the forest on an exciting adventure. Children get to ride with a parent (and shout ‘mush mush!’ at every opportunity!) while grown-ups can all take a turn at actually ‘driving’ their own sled! 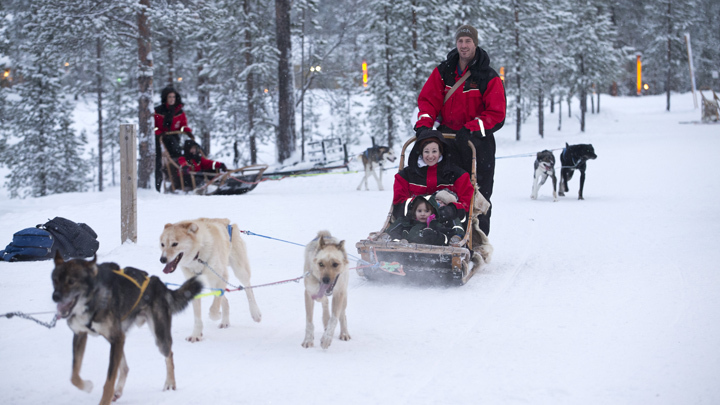 Race across the snow after releasing the dogs for a run and experience the best way to experience Lapland’s winter wonderland. If you can't get enough of our huskies, this additional trip gives you the full thrill of driving your own team of huskies. You are picked up from your hotel and then driven to the husky farm where full instruction is given on how to drive the sled and command the huskies. Learn more about our husky heaven.